I'm a 59 year-old with no significant medical history. I am also a former critical care nurse. I recently began to feel palpitations which became very distracting - mostly when I'm sitting at work during the day. I purchased a mobile EKG monitor device to get some insight into my rhythm as I wasn't sure if I was experiencing atrial fibrillation or some other type of ectopy (PACs, PVCs, etc.). Even though it's only a single lead ECG, I could immediate see that I was dealing with intermittent monofocal premature ventricular contractions (PVCs). I am a 44 year old, female with multiple autoimmune diseases. I was having occasional chest pain that seemed to be clustered into good days and bad. I can go 10 days without any and then they start a few on one day, then more the next day, and the next, until I have a horrible day of nonstop chest pains and palpitations. Then they wind back down to none and I have a few days of relief. I had the echocardiogram and wore an event monitor for a month. They diagnosed me with PVC (premature ventricular contractions). When I was hospitalized a heart monitor recorded strip was sinus rhythm with 38 premature ventricular contractions (PVC). They said there were no findings for cardiac problems. I am now on a Zio patch for 7 days. This is my second day and I have had palpitations that last up to an hour. My heart rate ranges from 38 to low 40. I have had 40 episodes in the last 24 hours. I am 35 years old. I have always experienced the occasional palpitation, maybe 1 or 2 a month. Three months ago I had a cold, and since that time I have had daily frequent palpitations. It started out as maybe 20 a day but now recently on some days I estimate 100 to 200. I had Holter monitor which showed 140 premature atrial contractions (PACs) and 7 premature ventricular contractions (PVCs), and I had echo normal. One night I woke up when they would not stop, drove myself to the emergency room. All lab tests normal, the monitor showed PVCs, no one cared, and they sent me home with a dose of a beta blocker. I saw a cardiologist the next day. I wore an event monitor for 2 weeks, and cardiologist said there were frequent PVCs, so I had bubble study and stress test, all normal. Seeing an electrophysiology guy in a month. I am completely miserable. I am taking metoprolol ER 25 mg daily. I tried to take it twice a day but I was so foggy. I don't think it's helping at all. I just want to feel normal again. I wonder if it all is stress related. I recently turned 45 and am probably the healthiest I've ever been. I have lost 30 pounds in the past 3 to 4 months and will continue to. My blood pressure, cholesterol and all blood work is perfect. It always has been. But recently I started experiencing what my doctor thinks are premature ventricular contractions (PVCs). I wear a Holter monitor next week and I hope it picks them up so we can confirm the diagnosis. My doctor's explanation as to why I'm suddenly feeling these over the past month or so is because of getting in better shape, my resting heart rate is lower, so the PVCs are much more noticeable. I just want them to get better because they're annoying! I don't drink caffeine (coffee) a ton, sometimes not even every day. Lately it's been cold, so I've probably had at most 2 cups a day. Shouldn't be enough to cause this, in my opinion. I have had PVCs (premature ventricular contractions) for over two years, ever since my grandpa died. Some days they will go on all day, and it makes it very difficult to sleep at night. Sometimes I feel as if I'm not getting enough oxygen, I try deep breathing, but I get anxious because I know my heart isn't beating normally, which scares me. They go away with exercise, but as soon as my heart rate begins to go down they start again. I have had multiple monitors, ECGs, EKGs, and even an MRI. The monitors showed moderate PVCs but all other tests came back normal. I'm constantly thinking and worrying about them. I can't imagine living with PVC for the rest of my life, because they are starting to affect my school and work. I am going to see my primary care physician this week and might be trying some anti-anxiety medication. Hopefully that stops the PVC and I can return to my normal life. I notice them mostly when I am stressed out, hungry, or before my period. I hope the PVCs end soon. They are so frustrating. This evening, I experienced this overwhelming feeling that felt like something took away my breath away. Gasp, followed by a huge breath. I took my pulse, it began normal, then three fast beats followed by a long pause, and then the heart beat began again. The premature ventricular contractions (PVCs) happened for approximately 1.5 hours. It is settling down now. I've been having palpitations since my late 30s. They started following some very stressful situations in my life. When they didn't stop after a few years, I finally found a doctor who listened, did a sonogram and discovered mitral valve prolapse (MVP). Now years later (I am 60), out of nowhere my palpitations have developed to the point of nonstop. After wearing a Holter monitor, having a stress test and another sonogram, this new cardiologist diagnosed me with PVCs (premature ventricular contractions). He said it is normal and nothing to be alarmed at. Sometimes I feel light headed, breathless and just can't stand the constant pounding and feeling of jitters in my chest. By the way, this doctor also said I do not have MVP. I've tried several self-treatments such as cutting out caffeine and I began a regimen of magnesium and taurine. I consider myself to be healthy, average weight (152), 5'3' and do walk daily (1 1/2 miles per day). I am to the point of screaming, crying and pounding my chest to make it stop. I first discovered I was having PVCs after experiencing periods of gray outs after exercise. After wearing a Holter monitor, I found that I had ventricular tachycardia of 30+ beats after exercise. I start to black out during those events. I had all the tests and my heart appears normal. I had an echo, an angiogram, an EP (electrophysiology) study and a cardiac MRI; all normal. I am currently taking Cardizem and it has helped, but I still have frequent PVCs but not so many long runs of V tach. My doctors are puzzled and can find no cause. It is still scary to start getting those runs of PVCs and wondering if they are always going to revert back to a normal rhythm. Scary stuff! I am a 32 year old female, not in the best of health, overweight with high blood pressure and a smoker. About 2 months ago I went to the emergency room because my heart would beat so hard it felt like a thud in my chest. This abnormal heartbeat caused me no pain but was very concerning to me especially since heart disease and attacks are high in my family. Upon the doctor's exam he found nothing and sent me home with the diagnosis of caffeine overdose. I went upon my daily routines cutting back the pop and sugar in my diet and also quitting smoking but the palpitations still continued, so I made an appointment with my regular doctor. He took my blood pressure, oxygen level and ECG and diagnosed me with PVC. He seems to think that my irregular heart beat is caused by stress and anxiety so he prescribed me Celexa. I will return to the doctor in 3 to 4 weeks for a checkup. My PVCs (premature ventricular contractions) feel like a really hard thud in my chest that sometimes causes me to cough. It sometimes feels like a quick squeeze and release of my heart. I started having PVC (premature ventricular contraction) issues the last month or so and have run the gamut of tests EKG, CT, stress test, MRI, and now I find out the heart is also enlarged; right side is working at 30 percent and left at 40 percent and no idea why. I considered myself to be healthy since I walked 5 miles a day or more for 23 years, a mailman, but now this. My cardiologist has given up for now. Some of your posts look and sound like my situation just wish doctors worked a little quicker, seems they like creating more stress. PVCs feel like an extra strong heartbeat that kicks in every now and then. It started with very occasional PVCs and now I get them more frequently -- a few times an hour. I am 62, female, and I have PVC s. They started when I was 21. I had all of the tests, and the doc prescribed a beta blocker. I used it for five years until it lost its effectiveness. I was told to "just live with it...it won't kill you." Well, it hasn't killed me, but it is not easy to live with. The nature of the palpitations has changed over the years, from feeling every missed beat to passing out from lack of oxygen to almost no symptoms at all. Is there ever a level at which the quantity of PVC's per day can indicate a major problem? My recollection is that my Holter monitor showed over 9,000 PVC's in a 24-hour period some time back. I do have some mitral valve prolapse but it is apparently not significant enough. I suspect that oxygen levels could be a problem because I regularly awake with bloodshot a eye(s). I do have sleep apnea, supposedly minor. I have CAD and a stent was placed in 2000. I have had pneumonia several times and take medication for asthma regularly. My symptoms appeared quite suddenly and persist off and on. 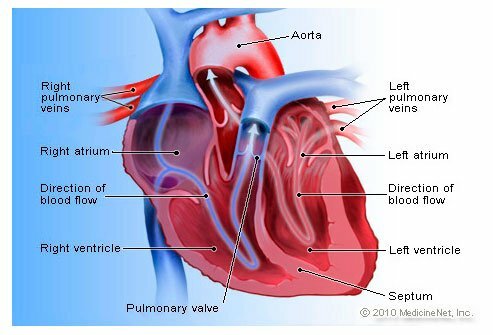 The PVCs may be as infrequent as one per minute or 25 to 40 % of the beats for a short run. A cardiac cath revealed an essentially normal heart. This has continued for 2 ½ weeks. The main symptom is generalized weakness. Sometimes my PVCs had different effects appear first. The reason I investigated and discovered what was happening to me is: it would feel like my heart was racing out of my chest, but when I checked my pulse, it was only half of my usual resting rate. I asked a paramedic friend of mine what that could mean, and he had lots of theories, but said I should go see a doctor. The second way I knew that I was having them was that I would get really sleepy and a little lightheaded. My doctor told me that was because the PVCs were limiting oxygen to my body and a lack of oxygen will make you feel sleepy. I had a mitral valve repair in June of 2010. It showed up on an electrocardiogram and was diagnosed as Premature Ventricular Contractions (PVCs). I do not have any symptoms.